Other than my usual stuff Terry has added a few things to my to-do list that she wants me to make. Im going to list those, then cover what is already on my to-do list. I’m not feeling overwhelmed – not yet anyway – but I do think it won’t be too long before I start drawing projects from a hat, so that everything gets an equal opportunity. That’s what life is about, not so? Equal Opportunity? 1) A BeachyTanT sign – to use at craft markets we go to. 2) Doorstops. We used to make doorstops, and sold them…. 5) Mini Driftwood sculptures. Never made anything like this before. 6) Framed pictures – pebble art etc. Never done this either. 1) 2 web design clients need attention. 2) Make more mini surfboards – 2 patterns. 4) More leather book covers in all styles (stock on all of these are low). 5) Wooden books. Handbound books with wooden covers. 6) Driftwood display stand – done 3, got one to go to complete the batch. 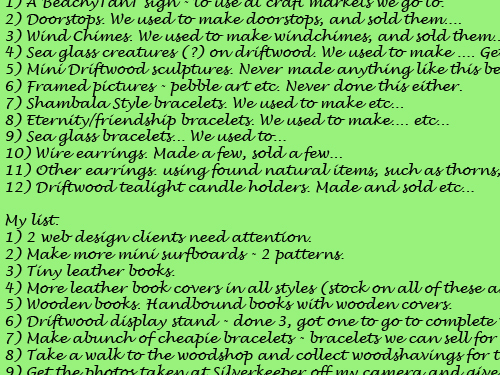 7) Make a bunch of cheapie bracelets – bracelets we can sell for R10 to R15. 8) Take a walk to the woodshop and collect woodshavings for the cats litter tray. 9) Get the photos taken at Silverkeeper off my camera and give them to Terry for processing.